this post is about praising to very kind persons. Lorenzo - who we got to know during last years private coaching session - sent us a big parcel with italian candy from his local area and well, I would loved myself to manage to get some photos of it, but with Raffa and our girls seeing the parcel it was quickly split up and enjoyed. So, so, so great of you, Lorenzo! Many thanks to you! What a big surprise it was!! Best Wishes from all of us! 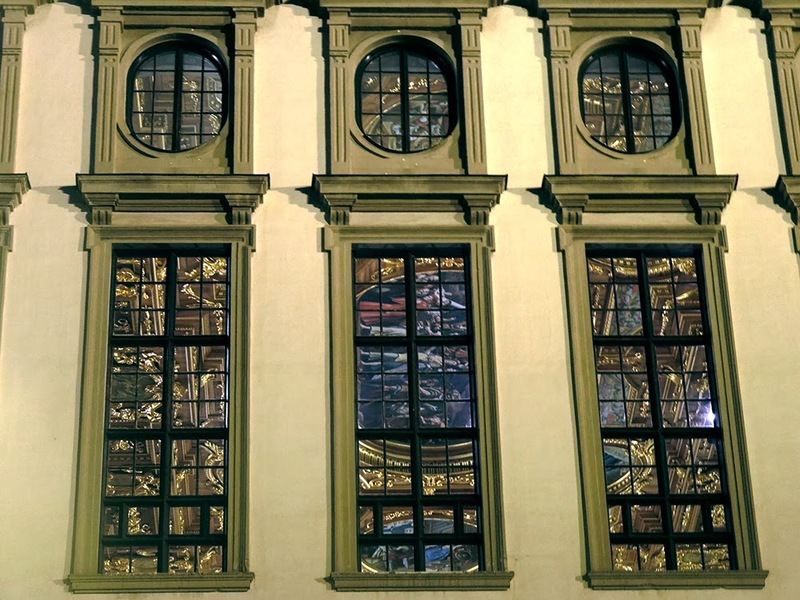 While I was heading for the studio once I made this cool photo of a famous place in my hometown - it is the major hall and there is one big golden room inside. As you can see on the photo I was on the outside but enjoyed how all that glitter and gold was seen through the windows ... beside this was the place were we went for dinner with Lorenzo. Not the golden room indeed but in the basement of the townhall. Good Memories. Thanks for the cool canvas, Kyle. So far, read you after the weekend and don't forget to enjoy some happy painting time for you! I Really enjoyed it, even it is not brand new. Maybe you can also find some inpsiration for your projects in it. Who knows? Meanwhile I am packing and preparing the upcoming painting class in Aschaffenburg, Germany this weekend. Looking forward to it. Next days will be pretty silent around me as we will arrive home late on Sunday. Monday will be a relax day and on Tuesday we have Roman from Russia visiting us for two days of private coaching here in Augsburg in our studio. 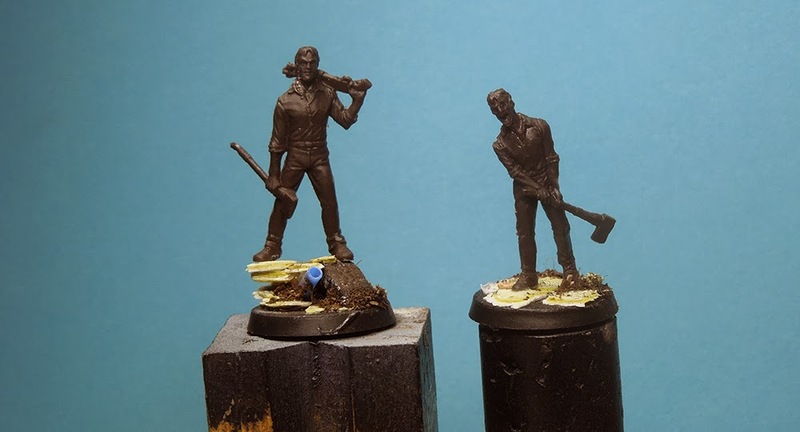 - Shall it be an interesting journey and insight on how I did paint up some of my Zombicide Gaming Pieces first? 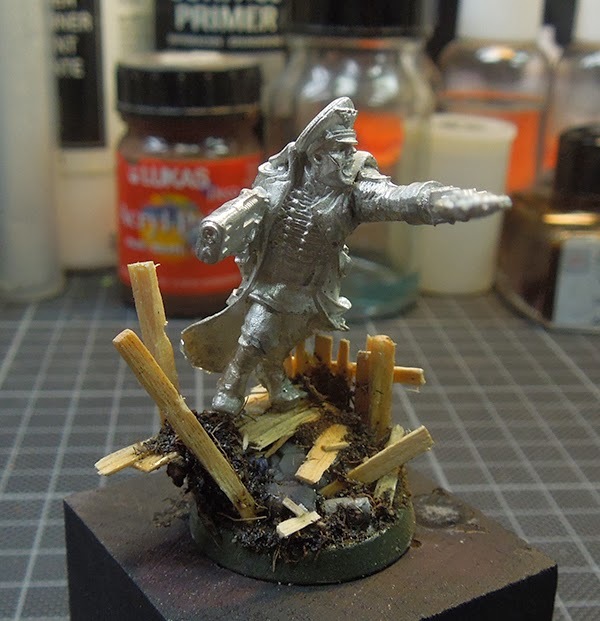 - Or shall it be a deep look on my experiences I have made while painting and working with 1:72 Samurais? For Samurais vote "Samurai" in the comments! Voting the next article will last until Monday next week. Well I will prepare and write the article then next week. Looking forward to it. I hope you too. 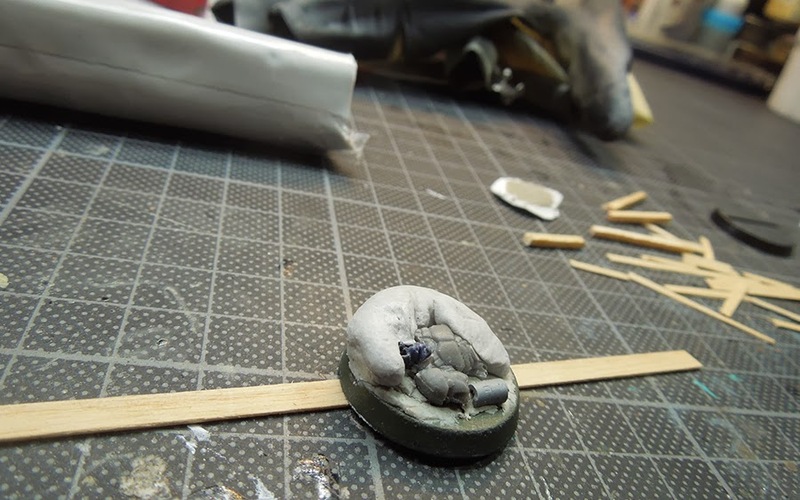 Definatly it is not the typical gaming base that you find out there as it is just to much work to do such stuff on many gaming bases, but maybe you have one model from your army that you are truely in love with, so spending more time on it is definatly not a bad idea. Where did I start from? The following photo shows you the early start. I took a gaming base, some Knead it! (now what is that? 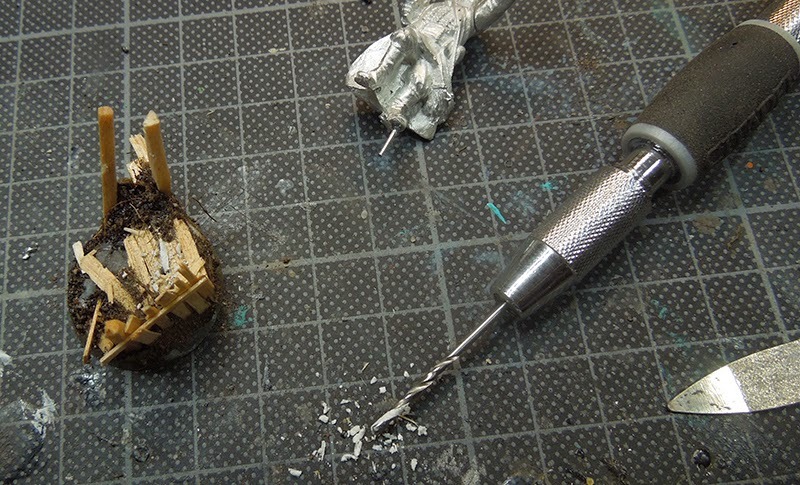 ), a skull and a body from McVey's Resin Marines. 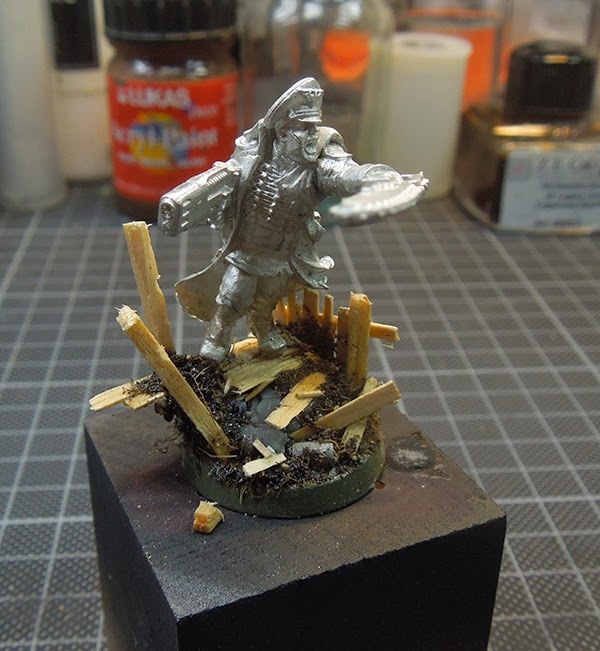 This will be a muddy corpse when the base is finished. 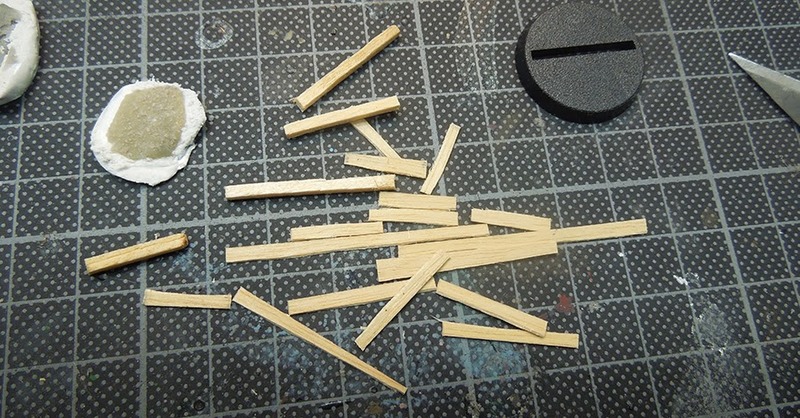 I prepared some wood pieces, toothpicks, coffeesticks or a match. What you can find will work for it. 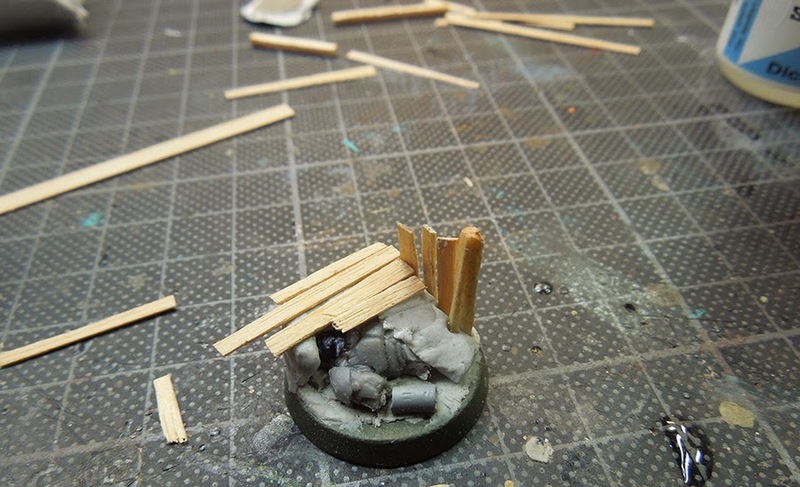 My plan was to create a little trench athmosphere. Next, Selleys Knead it! again. Knead it! 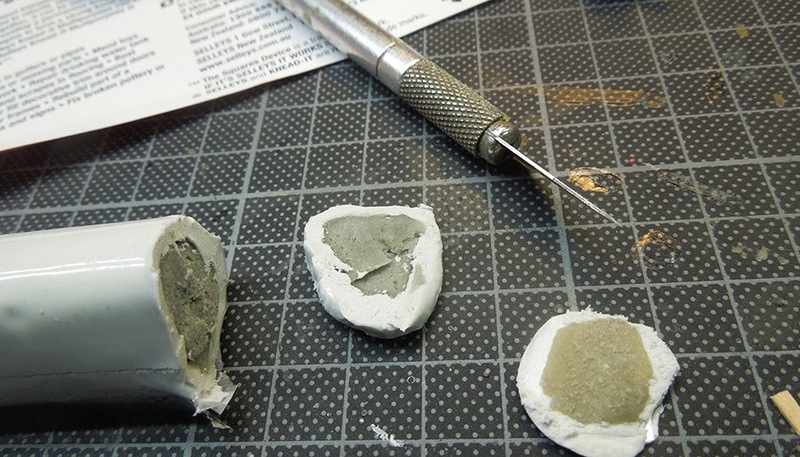 is a special sculpting putty that comes from Australia. Thanks to our friend Weisern the jungle got provided with it. I know that Weisern bought it in a craftmans-shop, where you also can buy tools and stuff. I am 100% sure that there are other brands who produce such material, just check for your local store to find out. So most important point for me here was the time saving. It hardens quick, so it was a good choice to build it under my construction that will follow on top of it. 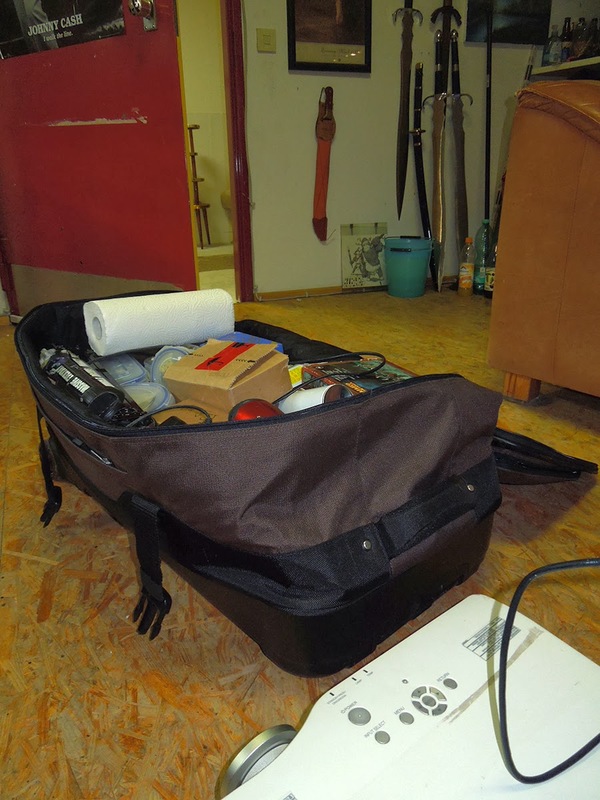 Usually I also have it with me when going for a painting class or event, as in the worst case, damage can be repaired really quick. Never happened thus far, phu! Important is to wear rubber gloves while working with it. Don't do it without, the putty gets very hot during its fast drying process and it is definatly not healthy for your skin. Please read the instruction of the putty that you use to prevent yourself from harm. 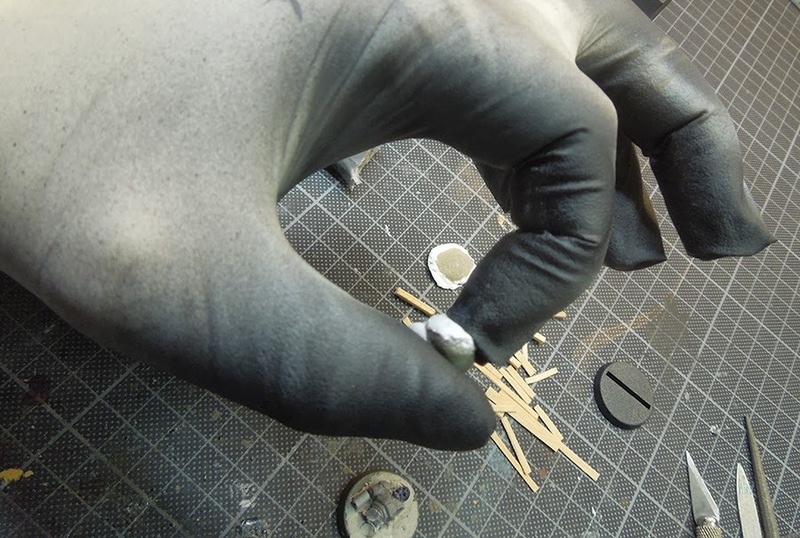 After opening it, I removed the silver prevention (keep that, you need it later on to put it back in place) and see that the putty is prepared for use in an intelligent way. Just cut off a small amount, very often you don't need too much of it. This is already too much, now it is cake slice time! Well, now not to forget the rubber glove and mix it. Make sure you want to know what you want to do before you start mixing it. You have to be quick as it hardens pretty fast. Think while basing, but don't worry too much! Don't forget to put back the silver protection on your putty. 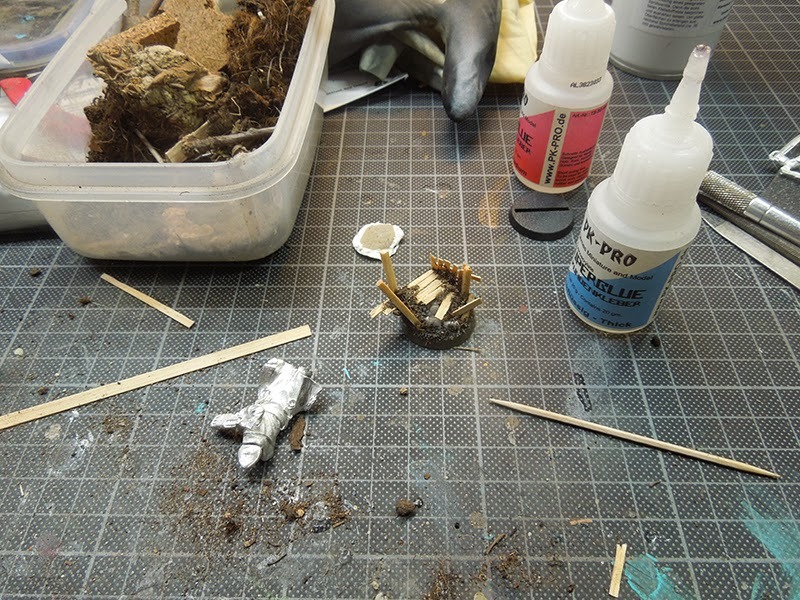 Next it was time for some soil/ common earth to be placed on top, done with super glue again. You also can spot out lillte damage that I cut into the wood pieces to make them more natural and random. 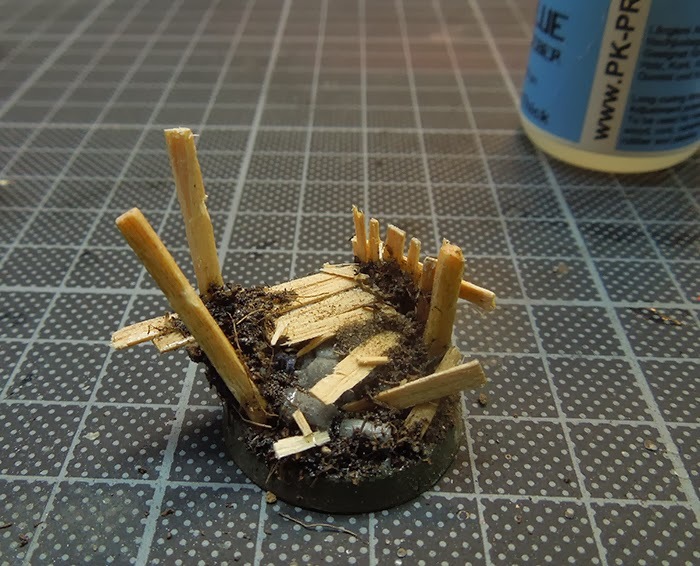 Also small pieces of wood where used to make the base more interesting for the eyes. Well, now it was time to pin the figure to the base. 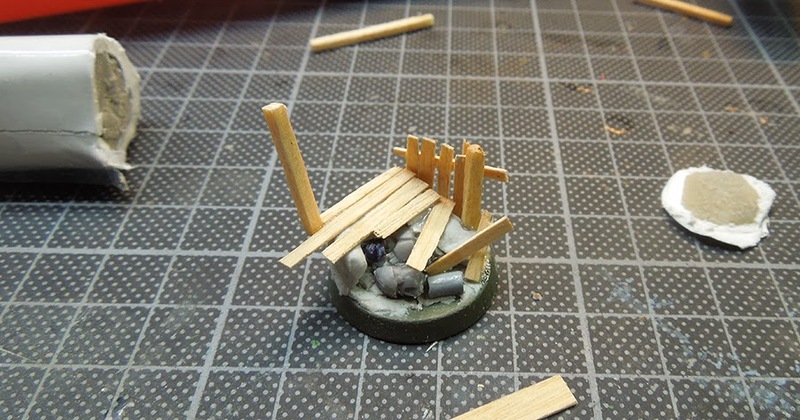 I was pretty happy with the result and it took me around one hour to build that base up. 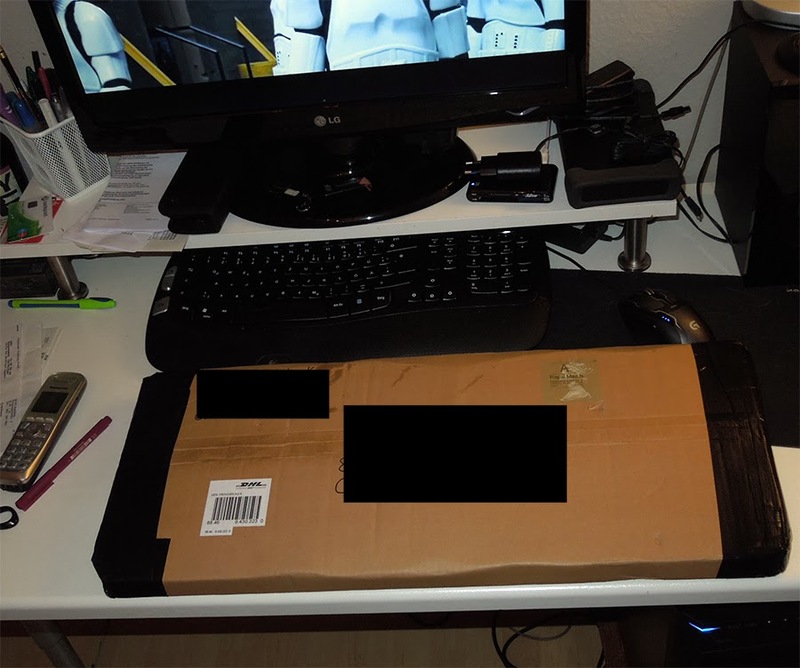 AS said before not the typicall gaming base and you should take care if you play with something like that. Don't let Murphy's Law drop it from the table. 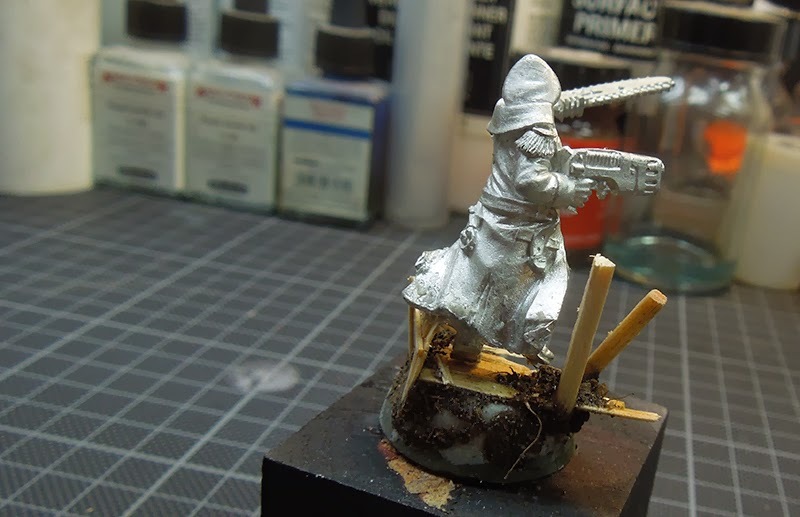 Last Step before priming was sanding the plastic of the base to remove the dirt there. Well, yes and painting it. I hope you like it! Let me know if there are any questions, suggestions, ideas or other thoughts of yours! Muddy dirty trench warfare ... how I imagined. It is time to pay this cool weekend in Trier, Germany proper credit. 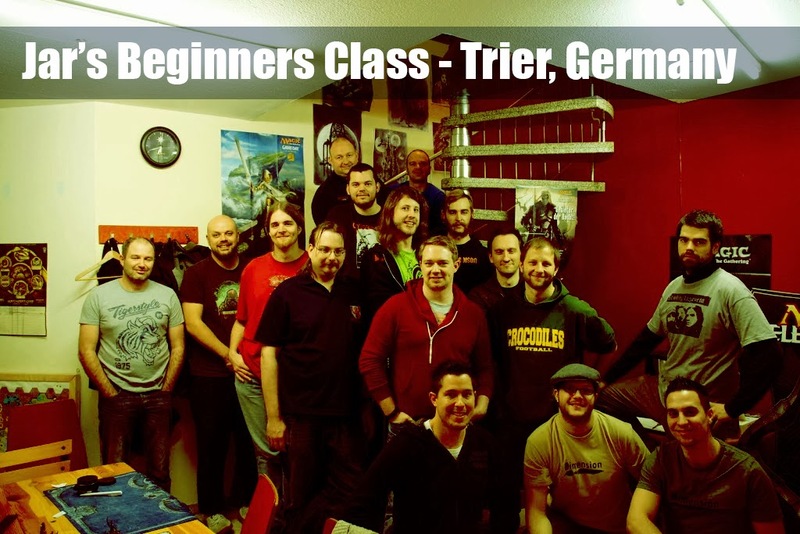 Well, I was travelling to Trier about ten days ago to have a quiet small beginner's class of my own. I knew there was one guy, Simon who would do the class for the second time. I was also looking forward to Pascal, the owner of the Spielbar in Trier. A really nice gaming store in an ancient city. Trier is famous for their Ancient Roman History. Check the link behind the picture! Thanks a lot to Pascal and the team of the Spielbar for helping Peter and me organise this class. Thanks to Peter for his help! Thanks for the smooth organisation that went from top to bottom, before and during the class. Thanks to Helfrich for a truely comfortable sleeping place, nice views during the car ride and talks we enjoyed in the car, beside the class. It was my pleasure! I was pretty happy due the travel to Trier as I am still in my ancient roman mania. Still reading many books. Thanks to the hint with the author "Ben Kane" I am still deeply involved with my brain in these ancient days. Thanks to Michael who picked me up from the train station I was able to see the Porta Nigra close, have some talk about the other roman locations in Trier which can be visited. I even brought home two pieces of wood from the ancient roman bridge which had to be reworked. That wood is more than twothousand years old and Michael who is working as a carpenter and joiner made one plinth from one of it. Surprisingly he gave it to me as a present. That was truely freakin' me out! But he also had to expect something from me and Raffa. He helped Raffa with building the socket for his Giu's Robot Repairs and therefore I had to bring a small gift from Raffa in form of a robot with some electronics in it to Trier, so I did. Michael also recieved a little gift from me ... the 1:72 Samurai on horse which I did in the end of 2013 was to become his in return for another favour. Really thank you, Michael. Well, there was not only Michael attending to the class. We have been 16 painters in the end and I was happy to welcome everyone of them. A truely nice group gathered toegether in ... the basement of the Spielbar. Not a regular basement it was. Also ancient romans used it to store food in there as the walls were truely salty. I did not get the whole concept why this happens but I was again set back in time, in this roman basement. Thanks to Pascal, the staff of the Spielbar, Erik, Raphael and Michael who provided this article with their photos!! Pascal making ready for the colours! Well and so we did with fresh energies. Sitting down and paint the whole day away until the middle of the night. We were working hard on different subjects that brought back Friday's theory part again but now in practical exercise. During the whole day we had several meetings, where I explained the next steps and I really have to say that it is always a pleasure for me to see how everybody is growing in their painting skills and mindset during the class. 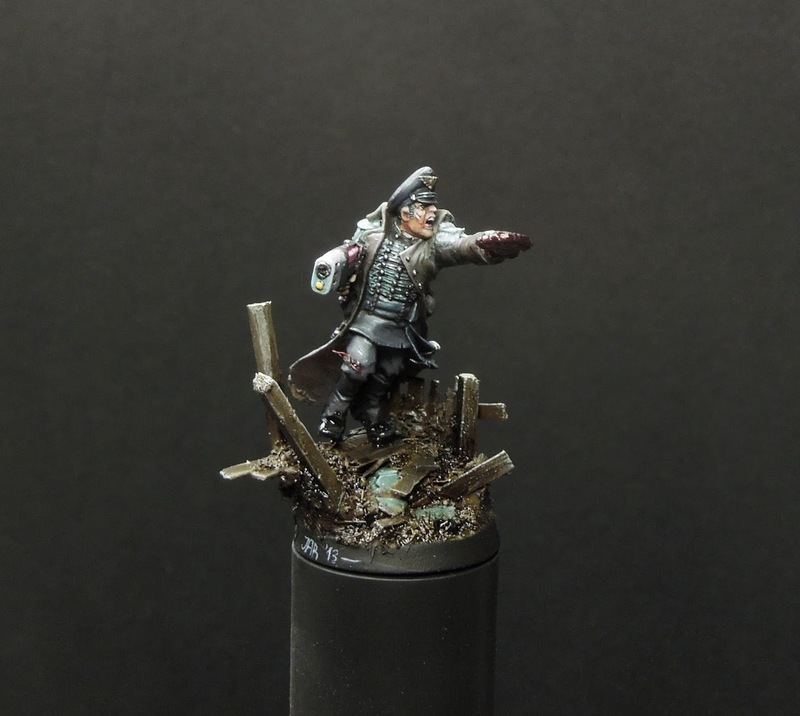 Everybody joins the class with different experience in miniature painting and I already can see during Saturday afternoon that everyone is doing big steps further. A real joy to watch, never able to bore me! Saturday night was pretty long as I was also "allowed" to show the additional presentation on how "The Last Light" was created. I did present this during Games Day 2013, but not everyone has been there and so I was happy that everyone enjoyed the end of Saturday night though. 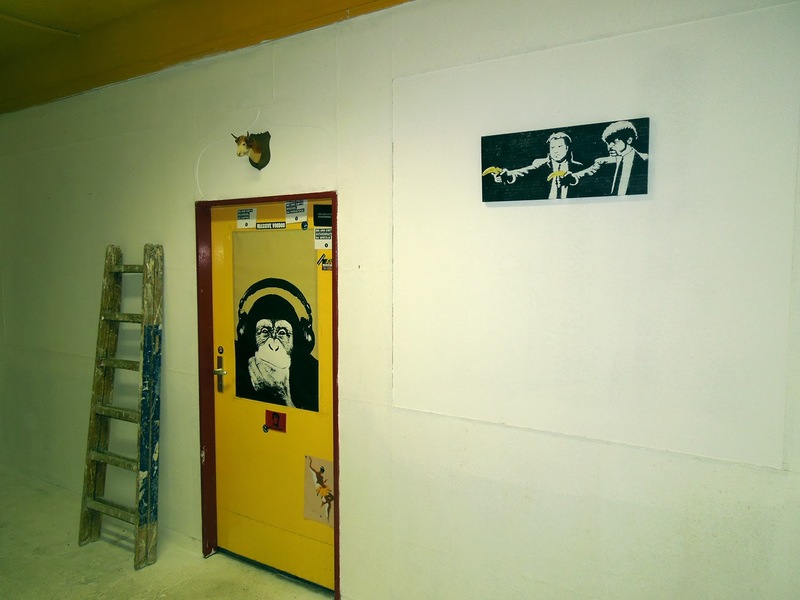 Sunday, again arrived earlier than expected and when I was entering the Spielbar-Dungeon close before the class would start I saw all students already sitting on their tables, painting on. Well, that's the spirit. During Sunday we worked on several main parts of the figure, but used most of the time for adding detail work. Again I introduced the students to different topics and afterwards everyone spent their time on the actual challenge. 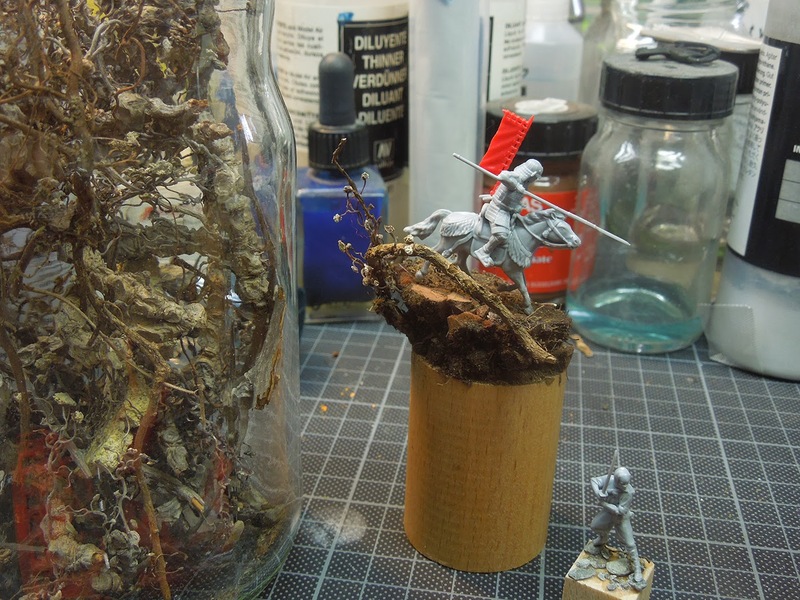 It never fails to amaze and surprise me on how the figures and bases come together to one piece, to one athmosphere during Sunday's working hours. A little lunch time was a welcome break, but everybody was strong and pushed on and on in his miniature. In the end I was not lying when I stood in front of the class and said that I was proud. Proud on what everybody has achieved during the class. 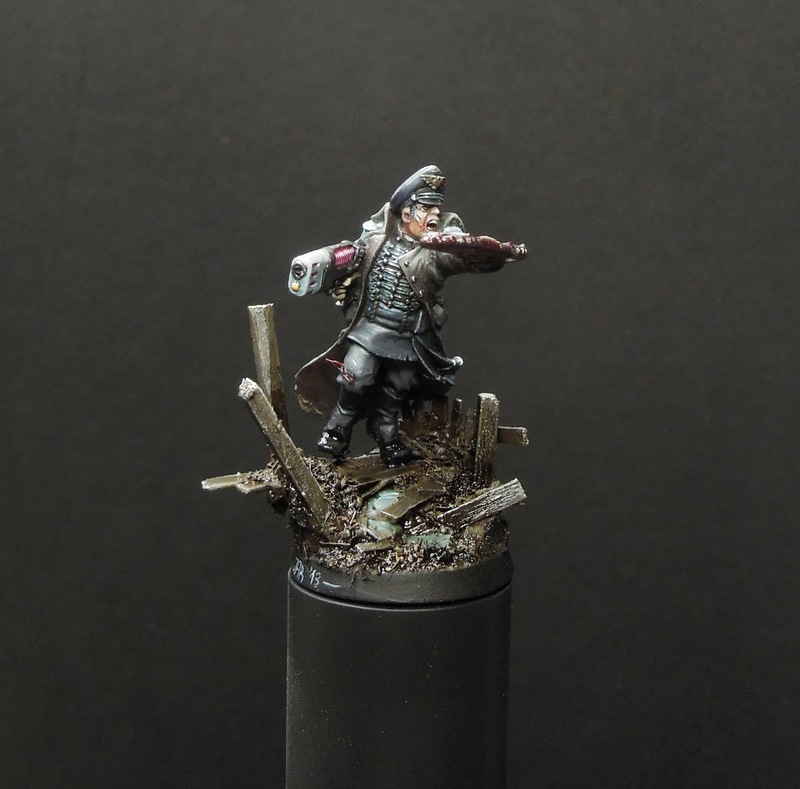 I also mentioned that the class's content is an extrem when it comes to the light situation painted on the model or the colour choices, but if you never experienced the extreme it is hard to get there on your own. Let's what the demon ladies looked like in th end. Well, thank you all for a great weekend! Stay put to your brushes and I hope we see again! You can read Michael's review over on 5th-Dimension!